What is the in-class Kaggle competition? What reference books do we receive? Where does the networking reception take place? What's included in the office hours? What does the mentored Kaggle competition include? What you receive during and post-bootcamp depends on which pricing package you purchase. 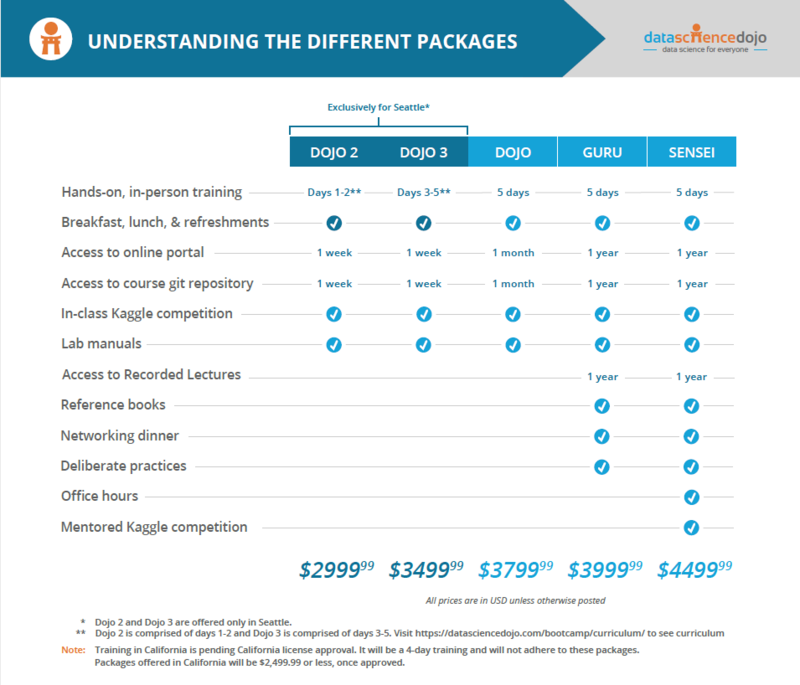 We have 3 standard pricing packages for most bootcamps: Dojo, Guru, and Sensei. For more detail, you can view our pricing package comparison. For our Seattle bootcamp, we offer Dojo2 (first two days), Dojo3 (last three days), Guru, and Sensei. During class, you will apply what you’ve learned each day to your predictive model. Your model will be built based on the Titanic data set. Whomever has the highest accuracy predictive model at the end of the course receives a special prize! Second and third place winners also will win a prize. The networking dinner typically takes place on either the Tuesday or Thursday night of the bootcamp in a reception hall or a restaurant close to the venue. Once registered, please RSVP for the networking reception to reserve your place. This is a great time to meet some of your fellow peers, network, and blow off some steam after class! Many friendships and co-working relationships are created during the networking reception! Note: Networking reception is only offered to Guru and Sensei students. In your learning portal you will have access to tons of deliberate practices! Get access to practice exercises with different data sets on our online lab environment! Hone your new skills after the bootcamp! What’s included in the office hours? After the bootcamp, if you are struggling with any of the topics covered in the bootcamp, we can help! Students are eligible for two half-hour sessions with one of our instructors. Office hours are only for Sensei attendees. Note: Office hours are limited to the bootcamp sessions. We are unable to provide assistance with specific personal work problems through this program. Students must request office hours within 14 days of the end of their respective bootcamp. What are the different pricing packages?